This entry was posted in Digital Marketing and tagged digital marketing on April 24, 2019 by admin. This entry was posted in Digital Marketing and tagged digital marketing on April 23, 2019 by admin. 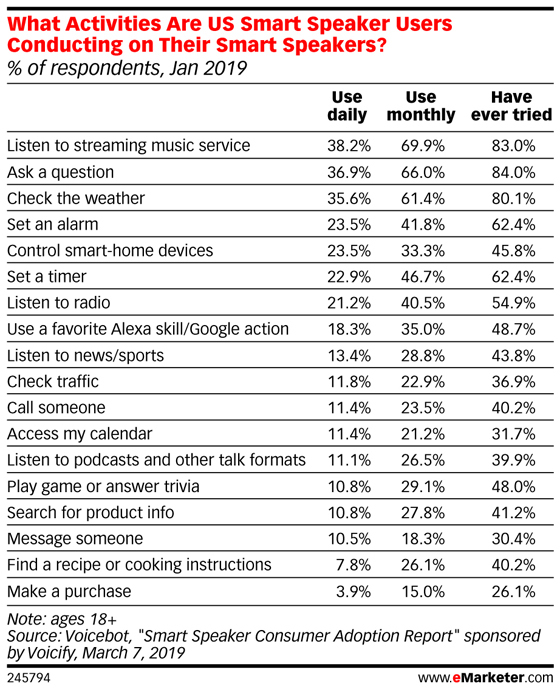 Monthly purchases made via smart speakers rose just over 5% between January 2018 and January 2019, according to a survey conducted by voice-tech companies Voicebot and Voicify. However, that’s still just 19% of all US smart speaker users. Monthly purchases made via smart speakers in the US rose by 5.4% between January 2018 and January 2019, per data from voice tech companies Voicebot and Voicify. However, those who shopped using voice accounted for less than one-fifth of smart speaker users. We forecast that 74.2 million people in the US—22.4% of the population—will use a smart speaker in 2019. 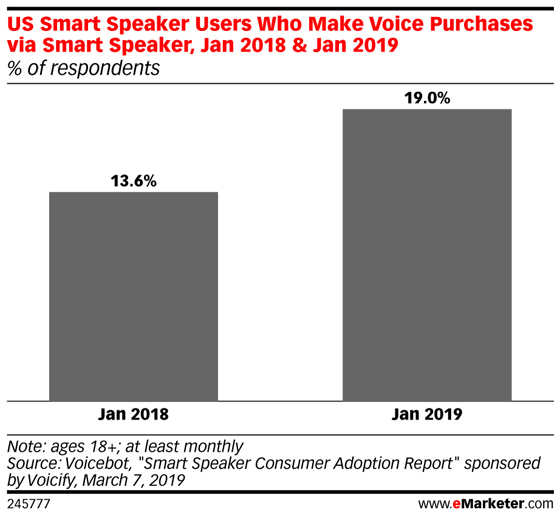 While 26.1% of smart speaker owners told Voicebot and Voicify that they had made a purchase using a smart speaker at least once, 15.0% claimed to do so monthly, and only 3.9% reported shopping this way daily. 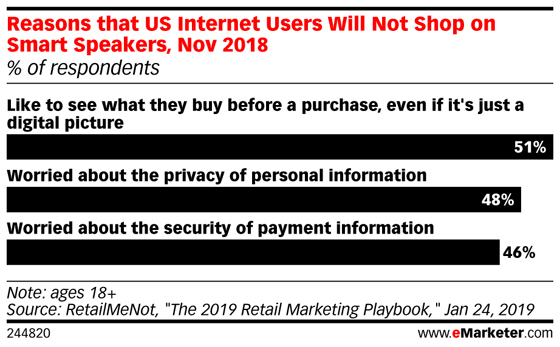 The bottom line: Regardless of frequency, purchasing is the activity smart speaker users are least likely to engage in. Join eMarketer principal analyst Andrew Lipsman, and learn the 10 key retail trends marketers need to know. Hear how mobile commerce and voice commerce are growing, how rising D2C brands are transforming traditional retail, what emerging technologies are gaining traction and more. Meet the Analyst Webinar presented by Braze. And, conversely, smart speakers and voice assistants are among the devices least likely to be used by shoppers. 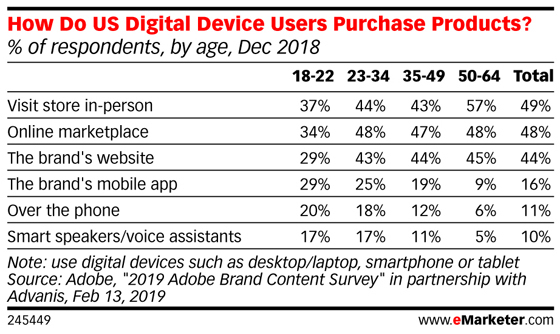 Just 10% of US digital device users purchase products on smart speakers or with voice assistants, even less than those who buy products over the phone, according to a December 2018 survey by Adobe and Advanis. Respondents ages 18 to 34 were more likely to shop with voice, at 17%. We estimate this age group will make up 38.1% of all US smart speaker users in 2019. Smart speakers do play a role in the path to purchase, but they have struggled to seal the deal with sales in the past. Surveys have shown that men are more likely to shop via smart speakers due to their higher adoption of the devices and inclination toward convenience. But increasing emphasis on visual content’s role in the shopping journey has caused many consumers to forgo buying via screenless voice assistants. A November 2018 survey conducted by coupon company RetailMeNot found that 51% of US internet users said they would not shop on smart speakers because they like to see what they buy before a purchase, even if it’s just a picture. Privacy concerns act as another barrier for smart speakers. Nearly half of respondents were worried about the safety of their personal and payment information. 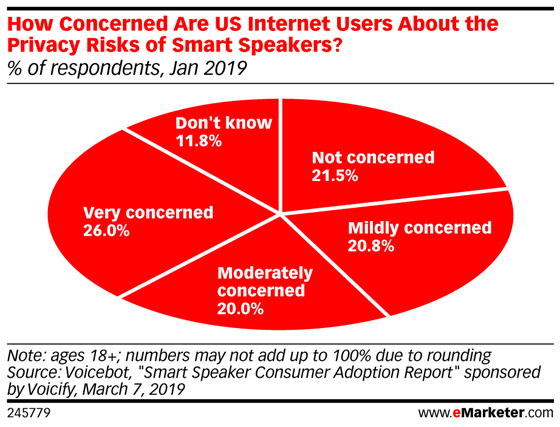 Additionally, two-thirds of US internet users in the Voicebot/Voicify survey expressed some level of concern about privacy risks with smart speakers in general. Perceptions could change if voice assistants become more commonplace, expanding beyond smart speakers and smartphones to various internet of things (IoT) devices, as we predict they will this year. But it remains to be seen whether voice technology will ever become a prominent buying medium, no matter what hardware it’s in. eMarketer Retail is published by eMarketer, Inc. Select “Research Submissions” for potential inclusion in the eMarketer Retail. This entry was posted in Digital Marketing and tagged digital marketing on April 22, 2019 by admin. This entry was posted in Digital Marketing and tagged digital marketing on April 1, 2019 by admin. This entry was posted in Digital Marketing and tagged digital marketing on March 25, 2019 by admin.